What a fabulous weekend of sailing we've just had! I have had way too much sun and am looking way too over roasted. I can't help it, that sun has just been gracing us here this summer and I'm loving the heat so much! I'm sure we've purchased a truckload and a half of sunscreen this summer. Both sails went up - this was the first time for us sailing on Cariere where we've put the mainsail up and had the genoa unfurled. It was fabulous sailing. Hahaha, I wish! They came zooming past and some crew waved at us. It took us 4 hours of hard sailing to get to Rakino Island. We got there, anchored up near the Three Sisters at 36°43′27″S 174°56′32″E, and went for a swim. 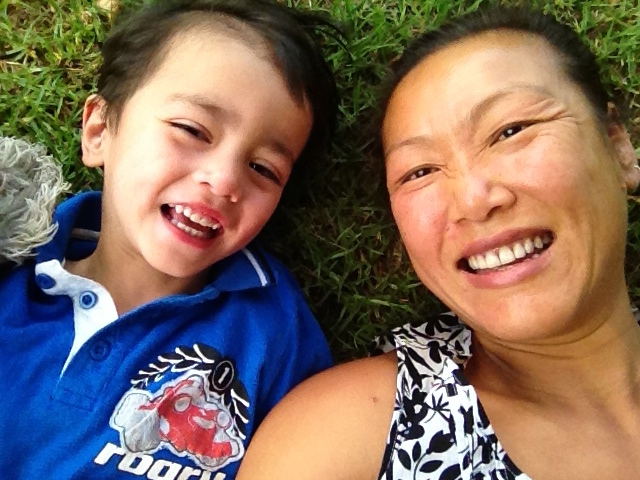 We boiled up some water and gave Kien a bath when he got out of the sea. Jef sizzled up some dinner for us. Delicious, even more so out here! Caught a beautiful sunset and moonrise over the island. After breakfast we got into the dingy and went on shore. We had a snack and hung around at the beach for a bit. We explored the amazing rock pools on this island. They were so full of life - Hermit crabs, small and giant periwinkle, oysters, mussels and tiny shrimp. Kien wanted us to climb to the top of the island. He demonstrated his climbing ability to tell us he was serious. It was way too steep to climb up there, so we told him we will come back soon and next time we will definitely have a wander up and around the island. We enticed him with a swim instead. Then we jumped back in the dingy and motored to the Three Sisters for a quick look around. Ah, it was such a satisfying weekend away. 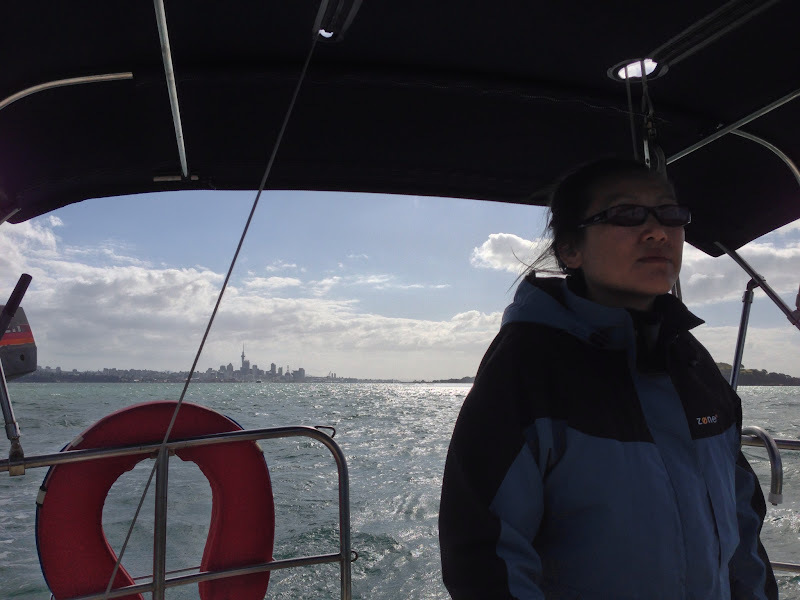 I'm so glad to have done my sailing course because now I kinda know what I'm doing, although I do need a lot more practice. This weekend's sailing was perfect for that. We had variable wind both going out and coming back, so I trimmed the sails accordingly. 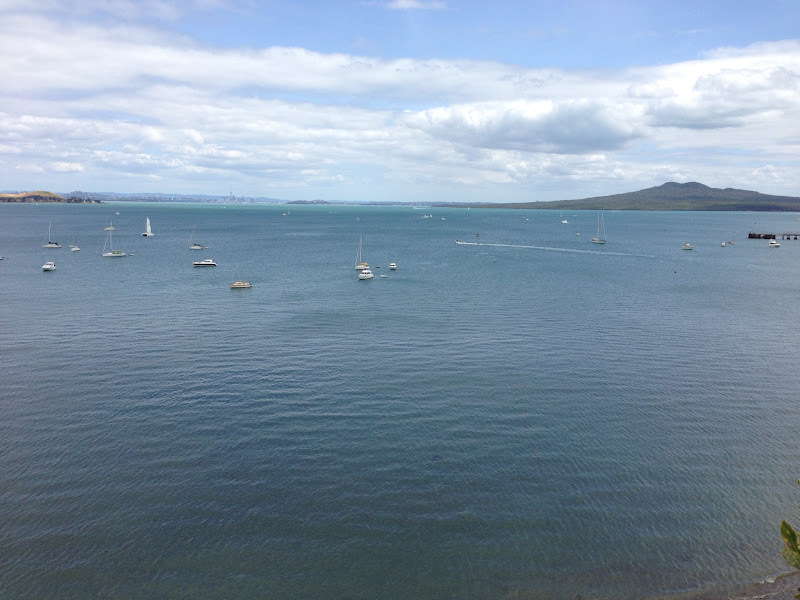 We sailed on a broad reach pretty much all the way from Rakino to the Rangitoto channel, and we got home in about 3 hours so that was pretty good going. Looking forward to my next sailing expedition. It was only midnight, and he was calling for me. It started as a whimper and turned into a plead. I always know when something is not quite right with him when he is having difficulties transitioning into another sleep cycle before 2am. I went into his room and gave his back a rub. He seemed warm, but he wasn't sweating. He fell back asleep. Half an hour later and I was awoken by his calls again. I went to give him some milk, and he didn't want any. I stroked his cheek, and he was hot...and thus began a LONG night. I'm certain I may have been up and down 540,789 times that night. That was Sunday night/Monday morning. Yeah, I did end up in his bed at 5am when I realised I might squeeze in a bit of sleep if I didn't have to get up another 1024 times. I still forced myself to get up at 6:15am to pack and get to boot camp in time - and when I walked up to this sight I knew I should have stayed in bed, because really, as if life before 7am isn't tough enough! 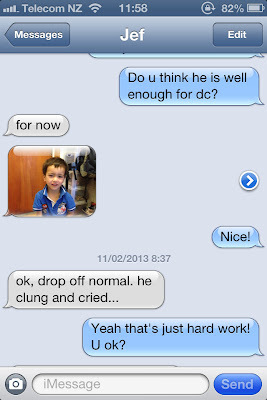 I wondered how Jef was getting on, and I got this text from him. And this pic of him ready for daycare - he looks fine, a little puffy, but fine. 9am - I was in the middle of my first coffee and I got the call from Tineke from daycare, "He's got a temperature of 39.5 degrees. You need to come and take him home"...and thus began a LONG day. 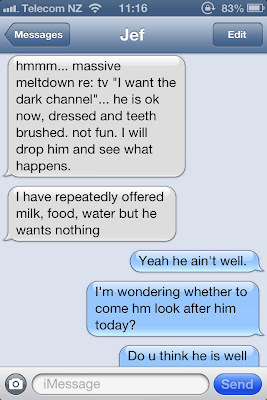 Actually, it wasn't too bad when we got home - besides the throwing up all over me and his bed, that is. But after his marathon sleep of 4 hours(!) he was looking better, and he asked to go outside to lay in the grass. He looked so wonderfully contemplative, even if he's just thinking to himself "Mummy, just give it a rest will ya? Can't you see I'm sick? Get that iPhone out of my face!" I lay down next to him on the grass, under the big shady tree outside our apartment, the sun rays filtering through the variegated leaves, the sounds of crickets chirping on this warm and glorious summer day, and it was so peaceful and beautiful. It is times like these that reminds me how parenthood can be so hard and yet so wonderful all at once. It seems we've been on the go go go since the start of this year. It's great being busy and having fun, but also very exhausting. I've finally sat down and processed our photos from a couple of weekends ago when we took off to Motuihe Island on the boat. I love taking the boat out at any opportunity. It makes me feel like we live a wild and adventurous life - out of the ordinary, a little bit different. This is why we've spent every Friday night sleeping on the boat since we've brought it to Westhaven marina - because we can. I am getting better at manoeuvring the boat and keeping it on course. I am looking forward to doing my sailing course. 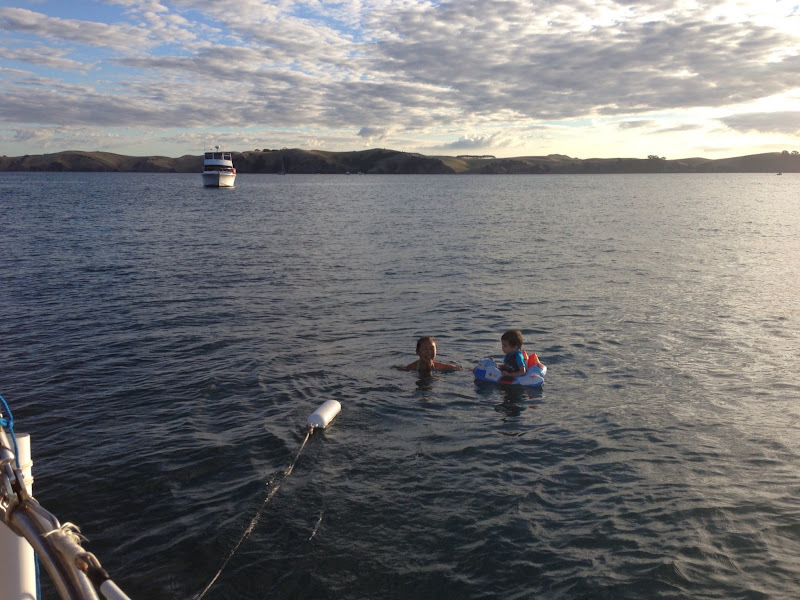 We anchored Saturday evening at Waihaorangatahi Bay. Kien wanted to try his hand at catching something, so we threw the bait catcher overboard. Nothing caught, but the anticipation on his little face and the excitement was pretty cool none the less. We watched the beautiful sunset with the backdrop of Auckland city in the distance. I am so grateful we have this opportunity to witness such spectacular sunsets. The following morning the ducks decided to drop by for some breakfast, much to Kien's delight. Luckily we had lots of bread for him to throw to them. 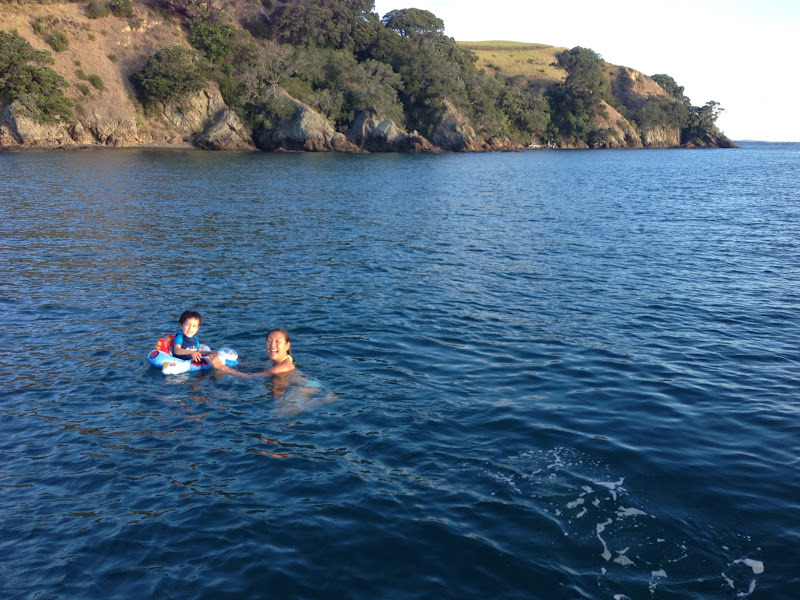 I had a fantastic swim before we got into our dingy and went ashore. This is the first time I've actually been for a wander around Motuihe. 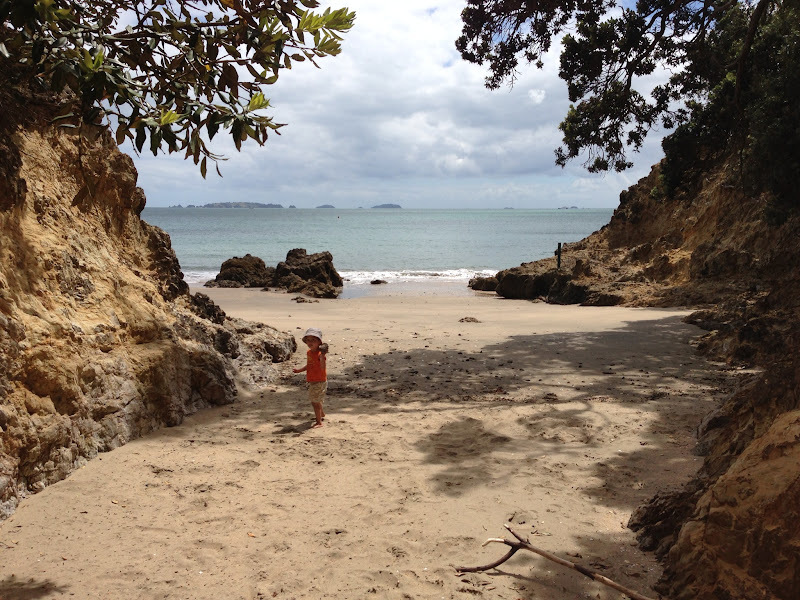 We walked over to the other side of the island to Takutairaroa Bay - it was a beautiful sandy beach, and we found ourselves all alone. It was wonderful. I love having the beach all to ourselves - free to run around and do whatever we please on what feels like our own private island. Happy to share with these guys though. Then we crossed back over the island to the bay where all the boats are anchored. It was a popular spot. It was a fabulous sail back home. 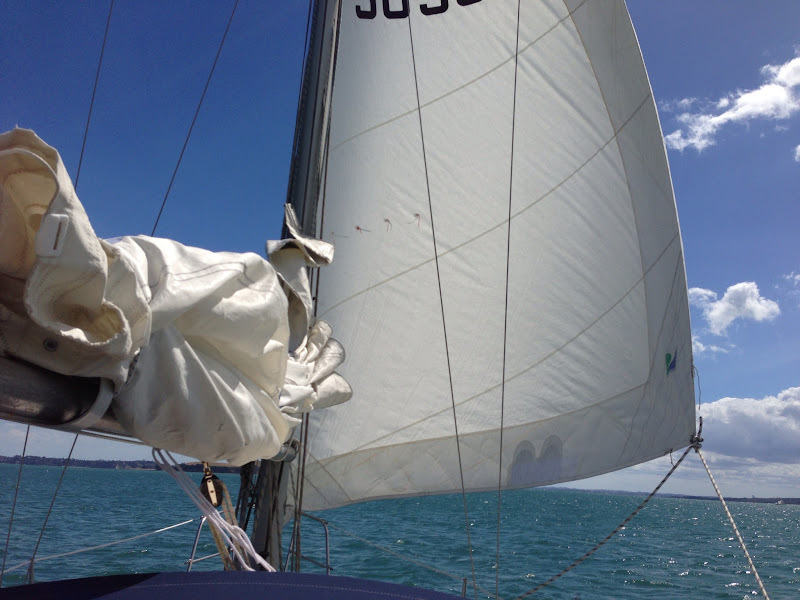 We had the wind behind us, and were able to relax and take it easy with just the headsail. I love this view - the sprawling city ahead, and Bean Rock to avoid. We are hoping to take the boat out tomorrow night. Fingers crossed for low winds!